Enjoy the top 45 famous quotes, sayings and quotations by Amy Ray. I think you just have to take the bad with the good and you're going to get hurt more, but it's worth it. At some point I was hanging around with the Butchies - a band I ended up playing with a lot - and it just brought out this thing in me ... and it felt very different from the Indigo Girls. I sit down and draw from my lyric book. I sit down and start looking through it and see if there is anything that strikes me that I've written. I have a lyric journal that I write in a lot. When I'm going to play, I just sit down and have my books with me and my notes and tapes and whatever I need to refer to. I just play and try different things. It's a kind of discipline. Music is such a good way to resist. It keep you strong, it has dignity. And when I am negative, I will be negative only for as long as I have to be, until I can understand it, and then I will be positive ... when I hate, I will turn my hatred into energy, when I am angry I will turn my anger into energy ... and I will not be complacent. I feel like there are a lot of people doing a lot of hard work. I think it's too early to judge, and I don't think the gay community is in any way falling short. The impossibility and hypocrisy of a situation where kids are expected to be honest but are judged and alienated from their community because of it should not escape us. “Ahhhh ... organic and rich like good soil ... makes me want to listen and hear it grow. Want to see more pictures of Amy Ray quotes? 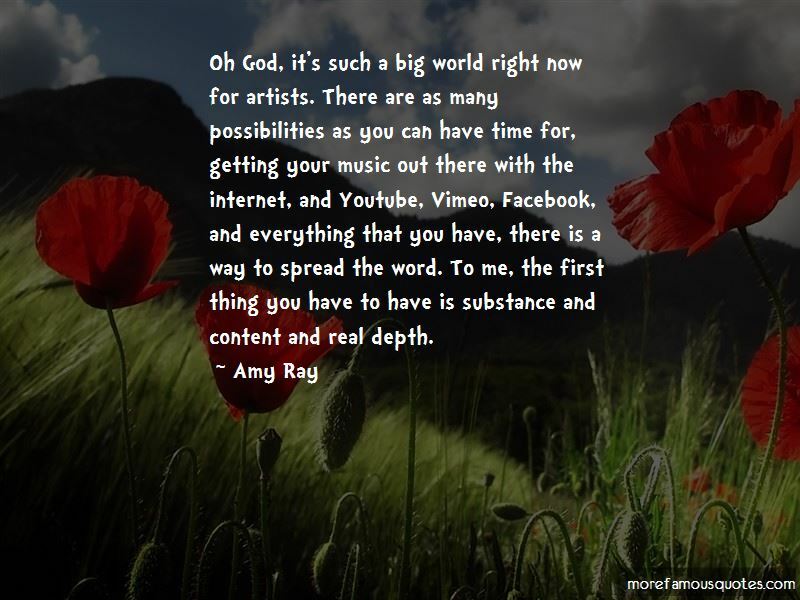 Click on image of Amy Ray quotes to view full size.